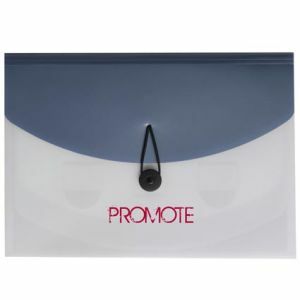 Promotional conference folders are a great way to get your brand out to a wide audience. 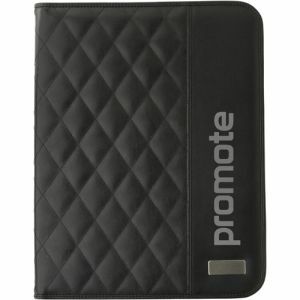 Your customers will be promoting your business every time they head to work on the train, arrive for a business meeting or attend a seminar because they are just so useful to office workers, professionals and students alike. 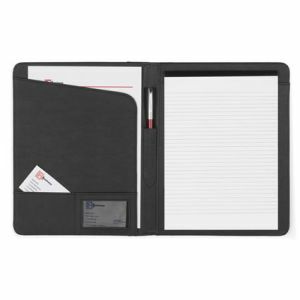 Printed or embossed, branded conference folders will keep papers safe, provide a place to store business cards and keep paper and pens readily to hand for note taking and, being completely reusable and refillable. 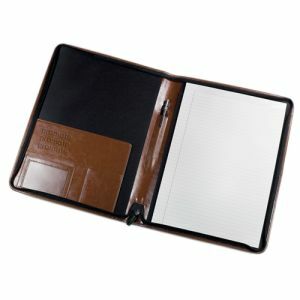 Their design also means they can last for years, extending your advertising potential far and beyond the initial spend. 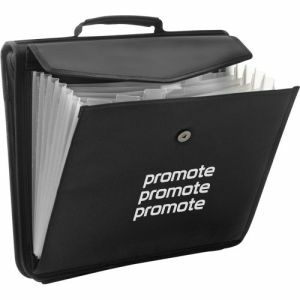 Recent research published by Eventbrite found there are over 85 million attendees at around 1.3 million UK business events each year, so if your business is exhibiting at any of these events, make sure your company name stands out from the crowd with a corporate conference folder. 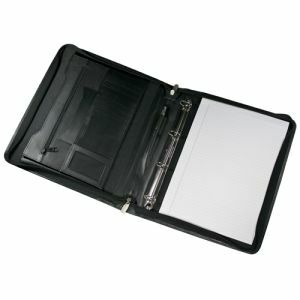 Whatever your budget or quantity required, there will be A4 printed conference folders that fit the bill. 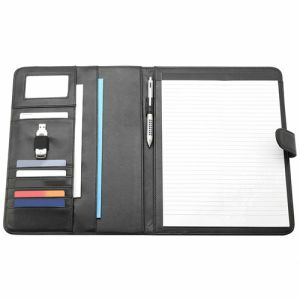 With prices starting at just £2.89 each (depending on quantity), our Express Budget Folders can also be turned around in just 5 days, so there’s no reason to miss out on any branding opportunities with even the tightest of deadlines. 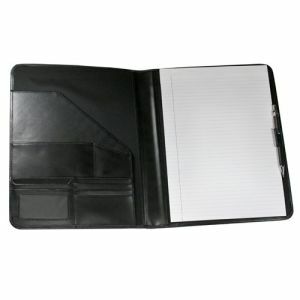 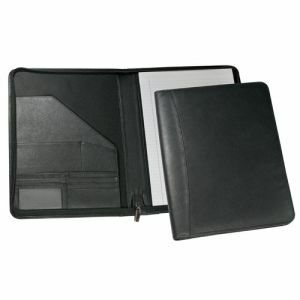 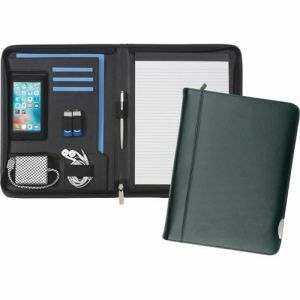 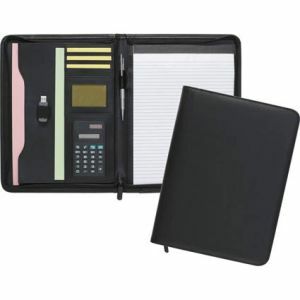 Or for multipurpose branded A4 folders, A4 Pembury Smart Zipfolios are the newest additions to our range. 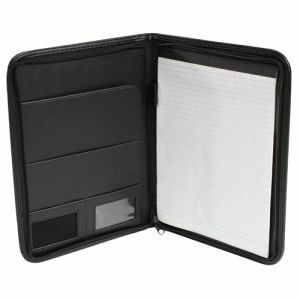 Each folder boasts a pocket for a smartphone as well as a double USB loop, recycled notepad, pen loop and a number of pockets for accessories and stationery items. 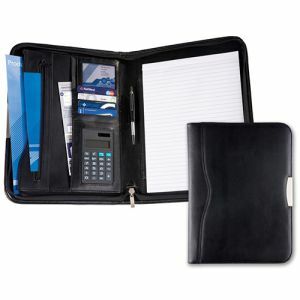 A great all-rounder, including an all-around zip for added security. 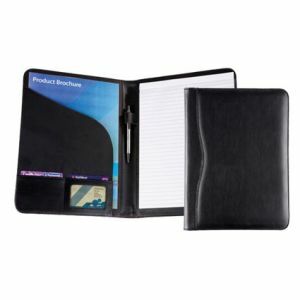 Our Dartford A4 Folders and Dartford A4 Zipped Folders are made from grained PVC and include a USB holder and recycled notepad, making an excellent business gift or conference giveaway with full-colour UV printing, as well as spot colour print available. 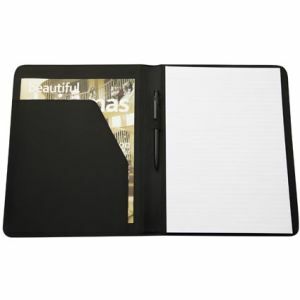 But you don’t need to take our word for it, as these are two of our A4 promotional folder best sellers. 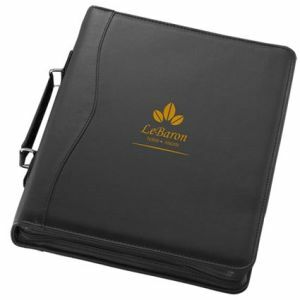 Conference folders are also well-received as corporate or executive gifts and our top-of-the-range Malvern Zipped Ringbinder Folders, and selection of Melbourne, Malvern and Warwick leather folders are crafted from smooth, water-resistant natural leather. 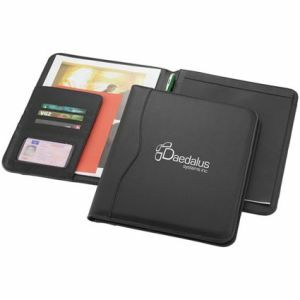 They can all be embossed or foil blocked to best reflect your business or logo. 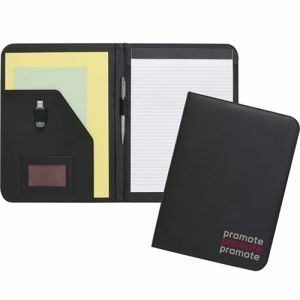 Featuring zip or simple flap closure for extra security or quick access to contents, choose the promotional conference folder style which most suits your intended audience. 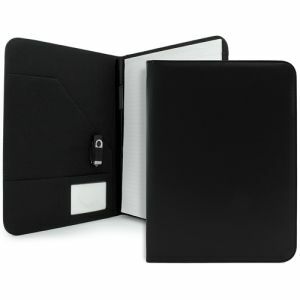 For a touch of luxury combined with full-colour print to luxury bonded leather, our Balmoral leather A4 zipped conference folders are supplied individually boxed as the perfect gift for key customers, top sales achievers or awards for staff. 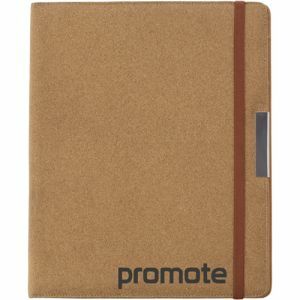 Branded conference folders with scratchproof interiors are perfect for holding iPads and tablets. 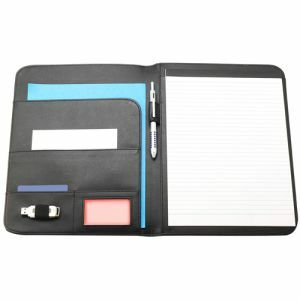 This makes them excellent sales tools for customer presentations or other sales meetings, literally presenting your material in the best light. 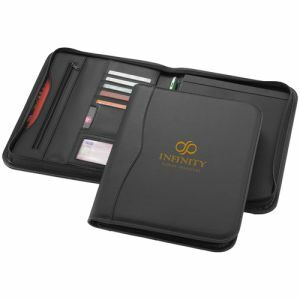 These can even be used as leave-behind gifts where the customer spend or the value of the potential future business is significant. 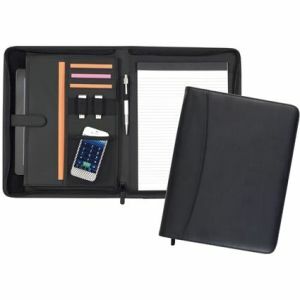 Also a great executive gift or giveaway for salespeople, designers, architects or anyone who needs to present or transport a tablet as part of their everyday job. 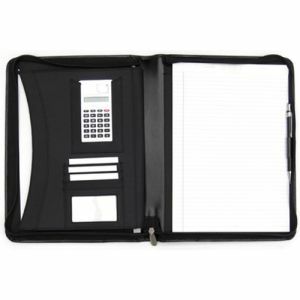 The Pembury iPad and Tablet Folders include USB and pen loops, a recycled notepad and a soft-feel sleeve to accommodate most tablets – and options include full-colour print or embossing to suit your needs. 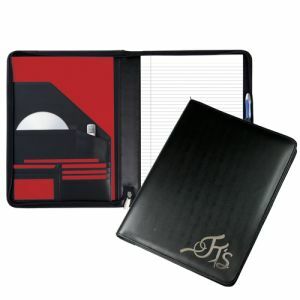 Are you organising an event or conference or looking to take your corporate gifts to another level? 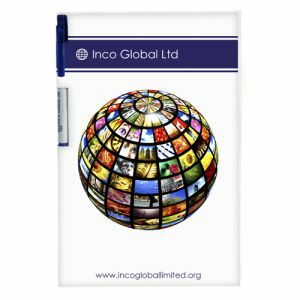 Let us help you find the right A4 printed conference folder based on your preferred print quantity, budget and requirements – and we can also help with branded pen recommendations to coordinate with your chosen branded folders at competitive UK pricing.